Does Peppermint Tea Help With High Blood Pressure? High blood pressure, also called hypertension, is defined as a blood pressure reading higher than 140/90, reports the National Heart, Lung and Blood Institute. When your blood pressure is high, your heart has to work harder to move your blood through your body to supply your vital organs with oxygen and nutrients. Hypertension may increase your risk for serious health conditions including stroke, heart disease, heart failure and kidney failure. Consuming peppermint tea regularly may help to lower your blood pressure, according to the University of Maryland Medical Center, although the evidence is still very preliminary. Make a cup of peppermint tea by steeping 1 teaspoon of dried peppermint leaves in one cup of boiling water for approximately 10 minutes. Speak with your doctor before drinking large amounts of peppermint tea. The tea is generally safe for healthy people, even in large amounts, although it may cause heartburn or allergic reactions. Avoid peppermint tea if you are pregnant or nursing, suffer from reflux disease or diabetes or take blood pressure medications. Avoid other forms of peppermint, such as peppermint oil, which is even more likely to cause side effects and medication interactions. Speak to your doctor about making diet and lifestyle changes to prevent and help treat high blood pressure. Your doctor may also prescribe medications to lower your risk of heart attack and stroke. In addition, maintain a healthy weight, quit smoking and find a way to manage stress, advises the National Heart, Lung and Blood Institute. Avoid self-treating your high blood pressure with peppermint tea, or drinking the tea to replace treatments prescribed by your doctor. 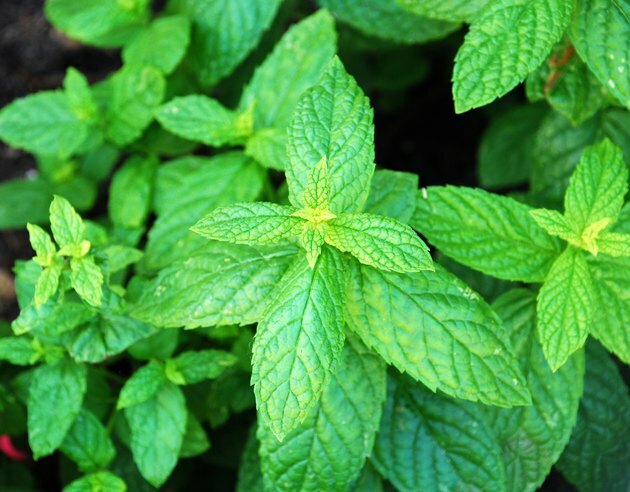 The evidence for the benefits of peppermint tea is still very preliminary and comes from animal studies. Further studies are needed to verify that the benefits apply to humans as well. National Heart Lung and Blood Institute: How Is High Blood Pressure Treated? What Types of Tea Are Caffeine Free?